“Join in one of Japan’s most distinctive rituals and see why refinement and subtlety are by-words in Japanese culture. 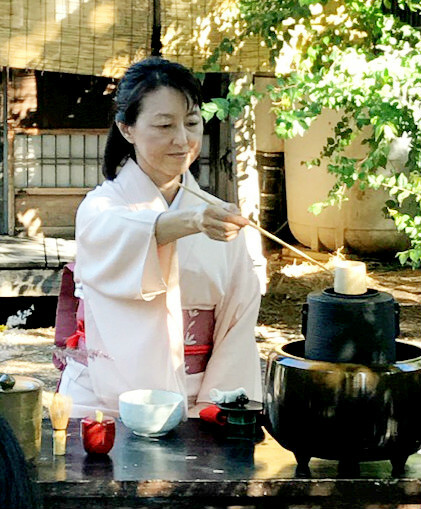 In classical kimono and following canons of etiquette established nearly 1,000 years ago, a master devoted to the art and spirituality of “The Way of Tea” will prepare and serve you a bowl of matcha, or powdered green tea, and a traditional Japanese sweet to nibble. Performed with all the formality and reverence that time-honored custom decrees, our Winter/Spring 2019 tea ceremonies take place February 9, March 23, and April 6, at 1:00 pm. The ceremonies are not intended for children under the age of 15. The February 9 ceremony has sold out, but you may still register to attend the ceremonies on Saturday, March 23 and Saturday, April 6. Please RSVP at least one week beforehand to yume.gardens@gmail.com, with your name, phone number, and the number in your party. If you must cancel your reservation, notify us as soon as possible, so that we may accommodate others who wish to participate. The cost to attend a ceremony is $15 per person, and you may purchase a ticket online. (Do remember to RSVP.) Click on “Events” in the menu bar at Yume Garden’s website, at the top of any page, then click “Buy Tickets” in the submenu that opens. Whether you obtain your ticket online or purchase it in person on the day of the ceremony, you must also pay the applicable Gardens admission fee upon arrival for the event. Members of Yume Japanese Gardens enjoy free entry, and pay only the $15 ceremony charge. This entry was posted in News by Carolyn Classen. Bookmark the permalink.